กัศมีร์ (ฮินดี: कश्मीर) หรือที่นิยมอ่านว่า แคชเมียร์ (อังกฤษ: Kashmir) คือภูมิภาคทางตะวันออกเฉียงเหนือสุดของอนุทวีปอินเดีย ซึ่งก่อนคริสต์ศตวรรษที่ 19 คำว่า "กัศมีร์" ถูกใช้เพื่อสื่อถึงหุบเขากัศมีร์เท่านั้น ซึ่งเป็นหุบเขาที่คั่นระหว่างเทือกเขาหิมาลัยและเทือกเขาปีร์ปัญจาล แต่ในปัจจุบัน คำว่ากัศมีร์ครอบคลุมถึงพื้นที่ในสามประเทศ ได้แก่อาณาบริเวณในปกครองของประเทศอินเดียที่เรียกว่า "รัฐชัมมูและกัศมีร์" และอาณาบริเวณในปกครองของปากีสถานที่เรียกว่าเขต "อาซัดกัศมีร์" และ "กิลกิต-บัลติสถาน" รวมถึงอาณาบริเวณในปกครองของประเทศจีนที่เรียกว่า "อักไสชิน" และ "คาหล่าคุนหลุน"
↑ 1.0 1.1 "Kashmir: region, Indian subcontinent". Encyclopædia Britannica. สืบค้นเมื่อ 16 July 2016. Quote: "Kashmir, region of the northwestern Indian subcontinent. 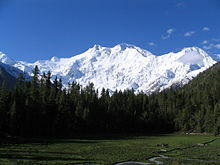 It is bounded by the Uygur Autonomous Region of Xinjiang to the northeast and the Tibet Autonomous Region to the east (both parts of China), by the Indian states of Himachal Pradesh and Punjab to the south, by Pakistan to the west, and by Afghanistan to the northwest. The northern and western portions are administered by Pakistan and comprise three areas: Azad Kashmir, Gilgit, and Baltistan, ... The southern and southeastern portions constitute the Indian state of Jammu and Kashmir. The Indian- and Pakistani-administered portions are divided by a “line of control” agreed to in 1972, although neither country recognizes it as an international boundary. In addition, China became active in the eastern area of Kashmir in the 1950s and since 1962 has controlled the northeastern part of Ladakh (the easternmost portion of the region)." ↑ 2.0 2.1 "Kashmir territories profile". BBC. สืบค้นเมื่อ 16 July 2016. Quote: "The Himalayan region of Kashmir has been a flashpoint between India and Pakistan for over six decades. Since India's partition and the creation of Pakistan in 1947, the nuclear-armed neighbours have fought three wars over the Muslim-majority territory, which both claim in full but control in part. Today it remains one of the most militarised zones in the world. China administers parts of the territory." ↑ Margolis, Eric (2004). War at the Top of the World: The Struggle for Afghanistan, Kashmir and Tibet (paperback ed.). Routledge. p. 56. ISBN 9781135955595. หน้านี้แก้ไขล่าสุดเมื่อวันที่ 23 ธันวาคม 2561 เวลา 01:12 น.